I can hardly believe it myself but I'm sharing another life lately post! These last two Wednesdays, I got to attend two concerts with my best friend Carina. First to see Hozier, a musician we both love and second, to watch the Game of Thrones Live concert. Both were incredible but for different reasons. The first time Hozier went on tour I missed out on tickets so when I saw he was touring again, I immediately told Carina that we were going (luckily she was on board with this). I love his album and I've watched enough Youtube videos to know he'd be amazing live. But it still didn't prepare me for just how good. As soon as he stepped on stage, we turned to one another and said he's really tall (but seriously he is) and two seconds later, we were turning to each other again to say omg he sounds so good. His music and voice just doesn't sound like anyone or anything else out there. Whether he was playing my favorites ("Work Song", "Like Real People Do", or "Cherry Wine") or something from his new EP, I enjoyed every second. Then the following week, we went to the Game of Thrones concert at Madison Square Garden. Neither of us really knew what to expect but it really is a fun experience for any Game of Thrones fan. The music is so vital to each episode and getting to watch that live only made that more obvious, especially with the accompanying scenes playing in the background. (Yes, they even did the Red Wedding). Plus it was cool to see the types of instruments they use and hear a little bit about the composer's process. I will say I thought it was a tiny bit long but aside from them, a lot of fun to experience! 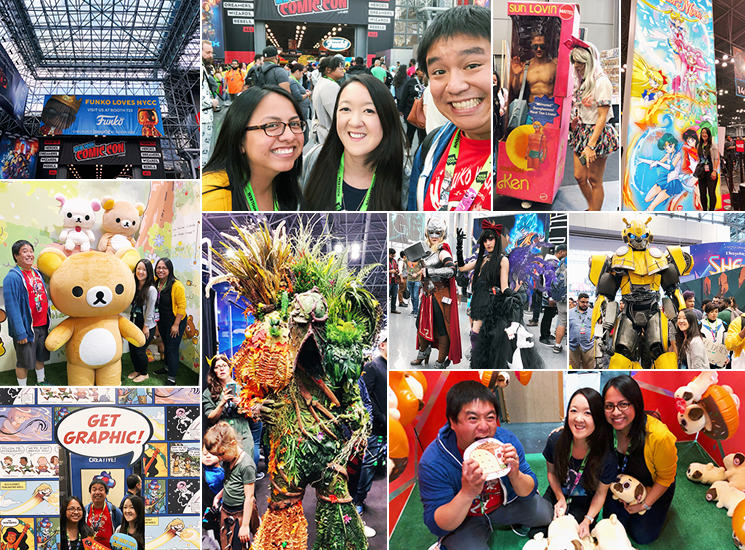 I finally attended my first ever New York Comic Con and I couldn't be happier. I went with my cousin and his wife and were honestly very chill about the whole day. We drove in, got a big brunch at Friedman's (highly recommend and it's one block away from the Javitz) and walked in around 11am. I was given great advice from friends who said there was no point lining up before 10am and it was better to just walk in after the rush (they were right). Then we basically just walked around the whole floor multiple times. There weren't any panels we wanted to see but I was fine with that because there were so many vendors to keep us occupied. We looked at t-shirts, anime, art, toys and anything else that caught our eye. We took advantage of the fun photo ops. I snagged a couple ARCs. We admired all the cosplay and I dorkily took pics because I was in awe of people's creativity and patience to dress up. I definitely fangirled over any merch related to Doctor Who or Sailor Moon and walked away with a couple t-shirts, the Your Name manga and the latest volume of Saga (I couldn't resist the Midtown Comics discount!). My one regret is that I didn't get to see David Tennant and Sean Teale in person. But I just lived vicariously through Alexa (for the former) and my other cousin (for the latter and who was kind enough to take a photo of him for me during The Gifted panel). 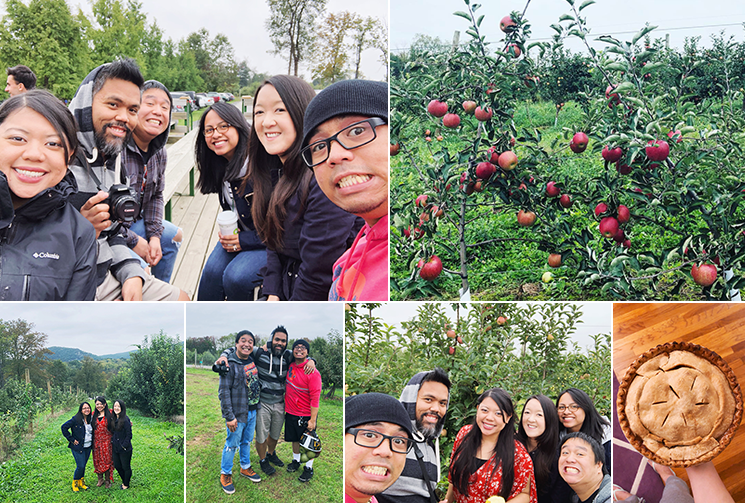 After planning last year's apple picking outing with the cousins, I knew I'd be making this an annual tradition. We went to Warwick Valley Winery again because it really is my favorite place to go. They have two huge orchards and a wide selection of apples to choose from. They have tractor rides to and from each spot plus an indoor/outdoor dining area with wine/cider/beer tastings, good food and live music. But the best part of the whole day (to me at least!) is the actual apple picking. My cousins are such goofballs and I don't know what it is about apple picking that makes them get especially silly but I was laughing almost nonstop. I really do love these moments with them. And by the end of the weekend, I stopped being lazy long enough to bake two pies! I still have a ton of apples leftover so I foresee some more pie baking in my future.